The Just Transition Centre was established in 2016 by the ITUC and partners. The Centre brings together workers and their unions, communities, businesses and governments in social dialogue to ensure that labour has a seat at the table when planning for a Just Transition to a low-carbon world. A Just Transition secures the future and livelihoods of workers and their communities in the transition to a low-carbon economy. It is based on social dialogue between workers and their unions, employers, government and communities. A plan for Just Transition provides and guarantees better and decent jobs, social protection, more training opportunities and greater job security for all workers affected by global warming and climate change policies. Empowering workers and their allies through sharing examples of Just Transition processes and plans, facilitating peer-to-peer skill and experience sharing, and capacity building on Just Transition. Documenting best practice in social dialogue processes through interviews, videos, reports and case studies. Starting and supporting social dialogue processes involving unions, communities, government and business, with participation from investors and experts. Strategic input to national and global policy dialogues and planning on Just Transition. In early 2019, the Just Transition Task Force of Canada provided two reports to the government on how to make the transition away from coal-fired electricity a fair one for Canadian coal workers and communities. Made up of a broad range of experts, the Task Force has completed its mandate. structural adjustment program for coal power regions. To assist companies in implementing a just transition, The B Team and the Just Transition Centre have published Just Transition: A Business Guide. This guidance contains operational advice and tactics, several case studies and analysis of the risks and opportunities of climate action on a company’s workforce. It provides ways for companies to engage with workers, unions and governments that are constructive to a clean energy economy that benefits all. Canada’s unions applaud today’s announcement by the federal government to strike a task force on “Just Transition” for coal workers. The Just Transition Task Force for Canadian Coal-Power Workers and Communities has been struck to draft a plan to support affected workers and communities as Canada moves to phase-out coal-fired power. Details of the composition of the Task for are available here. 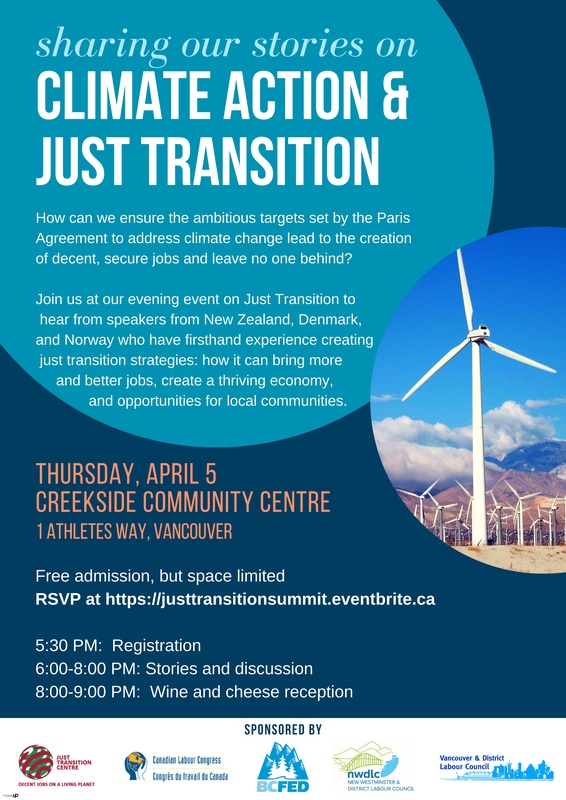 Join us at our evening event on Just Transition to hear from speakers from New Zealand, Denmark, and Norway who have first hand experience creating ust transition strategies: how it can bring more and better jobs, create a thriving economy, and opportunities for local communities. See the full poster here. Quebec is facing the challenge of an energy and environmental transition, and it must act soon and ensure that this transition brings social justice. The Federation des Travailleurs et Travailleuses du Québec has been preparing for this for the last four years. The full day event, which took place on 5 October in Wellington, was held at Te Wharewaka O Poneke for trade unions, government, businesses, Māori representatives, and environmentalists to explore how New Zealand can fairly transition to a net-zero emissions economy, while providing good jobs in well-supported communities. Unions leaders and representatives from Australia, Canada, Norway, South Africa, the USA, are advocating for national and city ambition on climate action and Just Transition at this week’s Global Climate Action Summit in California. ETUC: Trade unions and employers in the electricity industry have signed a joint statement supporting a ‘just energy transition’, calling for reskilling, quality jobs, social partners and local communities to be involved in change, and EU financial assistance to underpin the move towards cleaner energy. The Dutch trade union centre FNV is a leading voice in the push for a greener Netherlands. It recently published an advisory report entitled Energy transition and employment: Opportunities for a sustainable future. We hear from Kitty Jong, Vice President of FNV, on worker-lead solutions to a greener tomorrow. Actors from both the labour movement and from the private sector have been driving the momentum for a Just Transition. Here, they provide a snapshot of the reasons for their involvement. Carbon Brief explores the challenges and opportunities of just transition. ITUC’s General Secretary, Sharan Burrow, tells the story of Port Augusta, Australia, where workers and communities have a plan to transition from coal to solar power.